EuroSciPy 2015 debrief | I Love Symposia! The videos from EuroSciPy 2015 are up! This marks a good time to write up my thoughts on the conference. I’ve mentioned before that the yearly SciPy conference is stunningly useful. This year I couldn’t make it to Austin, but I did attend EuroSciPy, the European version of the same conference, in Cambridge, UK. It was spectacular. With this single line, your script will now generate an entry in a database every time it is run. It logs the start and end time, the working directory, the script’s git hash, any differences between the working copy and the last git commit (! ), and the names of any input and output files. (File hashes are coming soon, I’m assured). I don’t know about you but I have definitely lost count of the times I’ve looked at a file and wondered what script I ran to get it, or the input data that went into it. This library solves that problem with absolutely minimal friction for the user. I also enjoyed Nicolas Rougier’s talk on ReScience, a new journal dedicated to replicated (and replicable) scientific analyses. It’s a venue to publish all those efforts to replicate a result you read in a paper. Given recent findings about how poorly most papers replicate, I think this is a really important outlet. Another great talk was Philipp Rudiger on HoloViews, an object-oriented plotting framework. They define an arithmetic on figures: A * B overlays figure B on A, while B + C creates two subplots out of B and C (and automatically labels them). Their example notebooks rely a lot on IPython magic, which I’m not happy about and means I haven’t fully grokked the API, but it seems like a genuinely useful way to think about plotting. A final highlight from the main session was Martin Weigert on Spimagine, his GPU-accelerated, 5D image analysis and visualisation framework. It was stupidly impressive. Although it’s a long-term project, I’m inclined to try to incorporate many of its components into scikit-image. I was feeling a bit hypocritical for missing the sprints this year, since I had to run off before the Sunday. Emmanuelle Gouillart, another scikit-image core dev, suggested having a small, unofficial sprint on Friday evening. 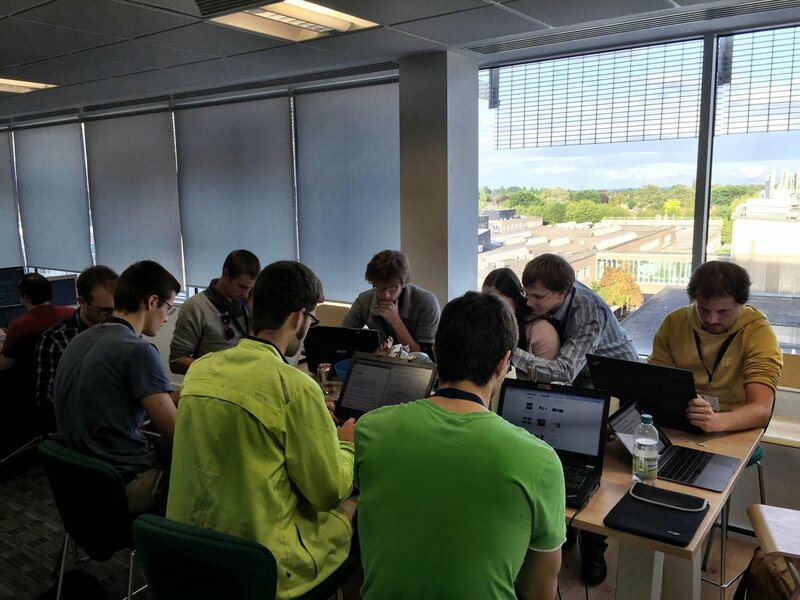 It grew and grew into a group of about 30 people (including about 10 new to sprinting) who all gathered at the Enthought Cambridge office to work on scikit-image or the SciPy lecture notes. A brilliant experience. As usual, I learned heaps and had a blast at this SciPy conference (my fourth). I hope it will remain a yearly ritual, and I hope someone reading this will give it a try next year!